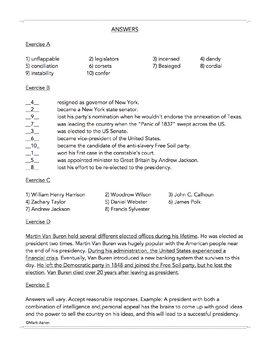 This US History reading and assessment activity helps address several Common Core ELA Standards that are listed below this introduction and is suitable for Grades 5-8. 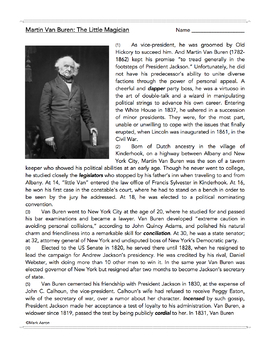 Students read an informative 900-word biographical text on Martin Van Buren, a dapper and distinguished gentleman but an ultimately unsuccessful president. 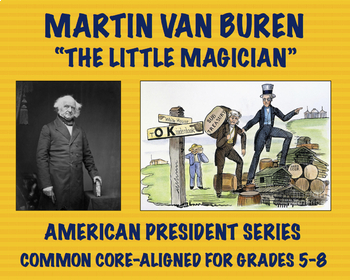 Van Buren, though small in stature, held many public offices and was a Democratic party boss, eventually rising to become Andrew Jackson’s vice-president and then his successor in the White House in the 1836 presidential election. This is his life story, beginning with his early years in Kinderhook, New York as a lawyer and following his climbing of the ladder of public service to president, including his handling of the “Panic of 1837” and the three losses he endured in his efforts to be re-elected president. 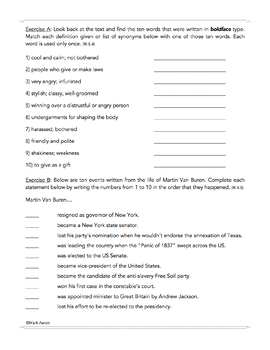 After the reading are 36 fill-in-the-blank, multiple-choice, and short-answer questions that require application of Common Core Standards to a thorough close reading of the biography. This resource can be used in a number of ways by teachers (close reading, direct instruction in class, independent practice, absence work, homework, test prep, assessment, centers, etc). RI.4.1: Refer to details and examples in a text when explaining what the text says explicitly and when drawing inferences from the text. RI.4.5: Describe the overall structure (e.g., chronology, comparison, cause/effect, problem/solution) of events, ideas, concepts, or information in a text or part of a text. This item is a digital download from my TpT store and is bound by copyright laws. The redistributing, editing, selling, or posting of this item (or any part thereof) on the Internet are all strictly prohibited without first gaining express written permission from the author. Violations are subject to the penalties of the Digital Millennium Copyright Act. Any claims of correlation or alignment to the Common Core State Standards are solely those of Mark Aaron and have not been evaluated or endorsed by the NGA. Mark Aaron is the sole creator of this product and does not claim endorsement or association with the creators of the CCSS.